Videos, Books, PDF’s and Bundled Packages. This is comprehensive video/vimeo-based and Html5 streaming curriculum for those with an evangelistic burden for reaching the lost. It can be used to train the outreach team during a weekend workshop, retreat, or in a small group setting. The Be His Witness, Part 1 seminar series contains ten sessions that vary from 40 – 60 minutes deliverable to just about any digital device you might use. It is available with a companion workbook. These valuable training tools will help you and your team learn about the biblical principles for effective intentional outreach as well as how to deal with the real-time challenges that you will face when sharing your faith with unbelievers. Click HERE to see the Seminar Overview Video. For more detailed description of each session and what it entails go to the Be His Witness, Part 1 page HERE. Click on Add To Cart to purchase a video download license. EACH VIDEO IS $5.00. You will be taken to PayPal. After you have paid you will be redirected to the video page where you can view/stream or download. Below the single videos you can purchase the whole group at 50% off for $25. A PayPal account is not necessary to purchase. Be His Witness, Part 1, The Use of Questionnaires & Pamphlets in Sharing The Gospel Workbook. This companion spiral bound workbook covers all seminar sessions with places for handy note-taking and a number of discussion questions for review. It has a wealth of concepts from the Scripture on personal outreach and will prove to be a valuable resource for your library for review later. You can even make copies of the lessons for your groups as well. *Please note: After payment confirmation, click on the “Return to Merchant” link on the bottom left of the PayPal shopping cart screen to access the downloadable pdf file. It is imperative the church take a fresh look at the task of evangelism. This book will help pastors, lay leaders, and ordinary Christians to work out their own personal practical ministry of outreach. It explains how the most effective evangelism is biblical in basis, conversational in method, spiritual in dimension, relational in context, and holistic in scope. When you purchase you will be taken to the digital download page (see instructions below) and your book will be shipped to you. When you purchase you will be taken to the digital download page (see instructions below) and your books will be shipped to you. Click on Add To Cart to purchase the product you desire to use in your ministry. You will be taken to a PayPal page. PayPal account is not required, but it will ask for your information. You purchase an individual license to download/view one of our videos/flash files by clicking on Add To Cart and paying for it through Paypal. You are sent to a download/viewing page with a description and hyperlink for accessing the video/flashfiles for streaming in Html5, pdf download, or videos available through Vimeo which makes it available for streaming or download – based on your preferences. Save or bookmark the page so you can come back to it later for further viewing or downloading. Would you like to provide a donation to Barnabas Missions so some individuals who cannot afford the training can obtain access to our materials? 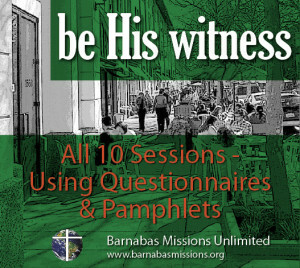 Please email us at office@barnabasmissions.org to find out how you can contribute to this worth cause for equipping those who cannot afford the training otherwise. Are you in need of a scholarship to access the training video and workbook? Please click on this link here to share your story with us. To download/stream any of the seminar session videos or reading material please click on Add To Cart then proceed to “Checkout”. If you would like to pay by check or money order (U.S. only), you can do so by sending a check in the amount of $5.00 per video, or 50% discount, or $25.00 if you buy all all 10 sessions in the seminar. Add $12.50 and we’ll send you a spiral bound copy of the companion workbook ($7.50 for a pdf copy by download). We will send you the appropriate links by email once we receive your payment. 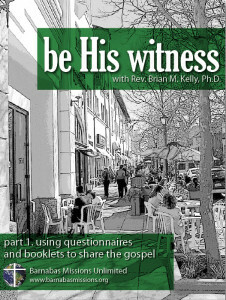 Purchase the whole package, including all 10 of the Be His Witness, Part 1 seminar sessions, the spiral bound companion workbook, and Dr. Kelly’s practical theology of evangelism paperback One Step Closer to Christ, and the pdf downloads of both for $50.00. LICENSE: Barnabas Missions Unlimited grants you a limited, non-exclusive license to access and use the videos you purchase for your own personal, non-commercial purposes. This license is personal to you and may not be assigned or sublicensed to anyone else. RESTRICTIONS: Except as expressly permitted by Barnabas Missions Unlimited in writing, you will not reproduce, redistribute, sell, create derivative works from, decompile, reverse engineer, or disassemble any videos you stream or download. All rights not expressly granted by Barnabas Missions Unlimited are reserved. It is understood that you may want to show your video to a larger group of people than individual use. While this is permissible, you do not have permission to share the download/streaming link(s) to those videos you purchased for others to stream or download for their individual use. If they want access to those download/streaming links they must purchase an individual license for such use. 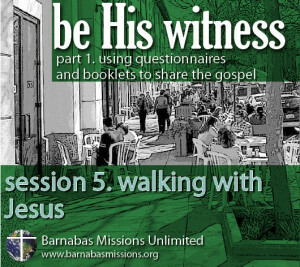 Group rates are available through Barnabas Missions Unlimited, please inquire by email to office@barnabasmissions.org to obtain feedback on groups rates for your church or small group for video access and companion workbooks.